The specific constituents of Viazen Energy are the key of the effectiveness of this SUPERIOR FORMULA. 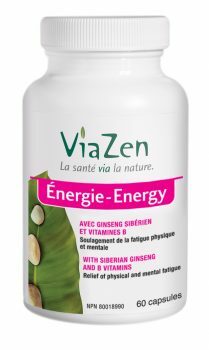 ViaZen Energy offers an efficient « TONIC » solution to improve mental and physical performances. Lack of energy appears when the body is unable to provide an appropriate energy level in response to its needs. * Daily dosage corresponding to 2 capsules of Viazen Energy. Vegetable magnesium stearate, gelatin. Viazen Energy is free from wheat, soya, corn, yeast, peanut, gluten, egg and dairy products. It does not contain preservatives, sweeteners, colouring agents, artificial flavours and is exempt of GMO. – Do not use during pregnancy and breastfeeding period. – Be aware in presence of hypoglycemic therapy. – Be aware in presence of auto-immune diseases or if you have any type of acute infection. – Be aware in presence of a low protein diet. Do not use in presence of high blood pressure. Energy drop appears following an accumulation of physical and intellectual efforts over several days, several weeks, as well as several months. It occurs when physiological energy request becomes more important than the capacity of the body to produce appropriate energy level. It becomes visible by the presence of many symptoms which is associated with a weak performance in usual daily activities. People affected by an energy drop will realize that they are not any more in full possession of their potential. The organism does not produce enough energy to meet its needs. This phenomenon can be caused by an insufficient energetic and nutritional supply (carbohydrates, lipids, proteins, vitamins and minerals). Specific physiological systems inefficiency can also be implicated. Indeed, thyroid and adrenal glands imbalance will automatically disturb biochemical reactions responsible for energy reserves (glycogen, triglycerides and proteins) degradation, necessary for cellular energy production. Moreover, nervous system will be quickly affected by the lack of glucose, because it is the only energy source used by nervous cells. If this control center is not well fed, it will have difficulty orchestrating adequately all of the metabolic reactions associated with energy production. At this time, many discomforts will appear. – Stimulant need: coffee, energetic beverages, black chocolate, etc. 3. Harrisson. Principes de médecine interne. 15e édition. Flammarion. 2002.